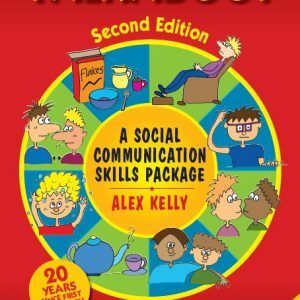 Categories: Social Skills, Adults, Other Talkabout Resources, Primary, Secondary, Special Schools. Fun, quick and easy to play, this game features the familiar Talkabout drawings to provide visual cues. 20 group games. Each game card includes instructions for playing the game and colour coding to show which cards are best to use. A lot of the activities can be made easier or harder by increasing or decreasing the number of cards. 51 illustrated cards. These include 10 pictures in each category: physical appearance, personality, topics, qualities and emotions – these have been colour coded for easy recognition.